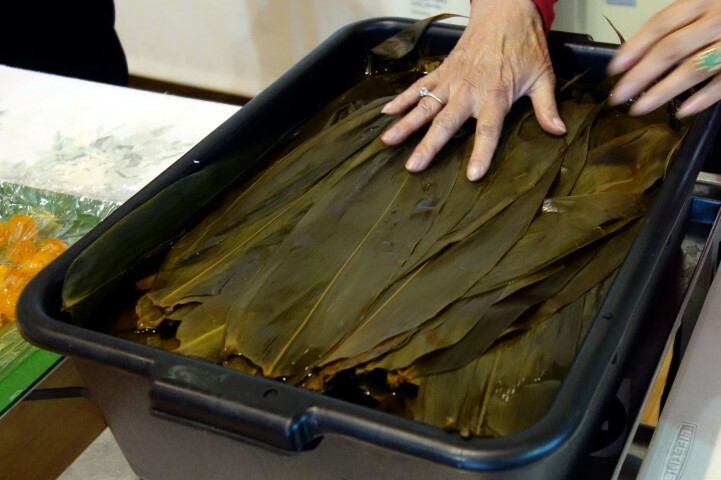 Soak bamboo leaves in a large container. Clean the leaves by rubbing two together, changing the water, repeat for 4 days. The night before assembly, places leaves in the dishwasher rack with 1 cup vinegar for a cycle of washing. Leave in dishwasher to cool to prevent the leaves from cracking. 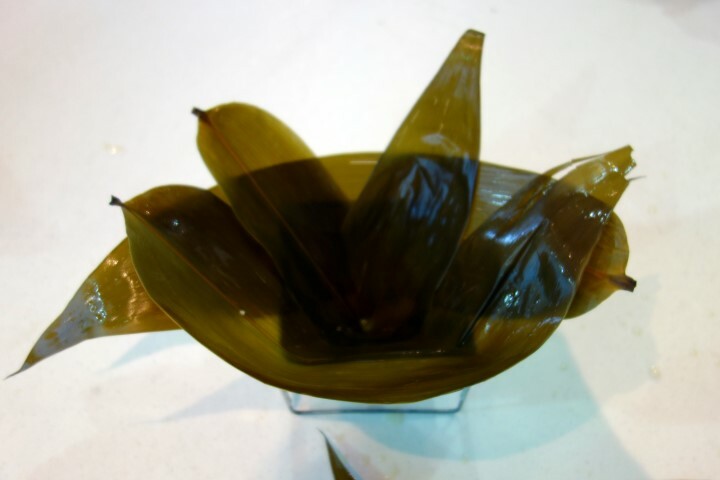 Keep the leaves submersed in water during preparation. Wash rice until the water is clean, cover with water and soak overnight. Drain the rice well and add 1/2 c. vegetable oil and 2 Tbsp. salt and mix well. Make a brining solution with the salt and water–bring to a boil. Stir until salt is dissolved. Cool brine completely. Place whole raw eggs in a glass container and cover eggs completely with the brine. Stuff the top of the jar with crumpled wax paper (this will help keep the eggs submersed under water), place another sheet of wax paper over the top of the jar, and secure it with a rubber band. Put the jar in a cool dark place (not refrigerator) for 6-7 weeks. Crack open the eggs and separate the yolks from the whites before using. Discard the egg whites (they’re too salty to eat). Discard any “rotten” eggs (they will be easily identified with their off-color and off-smell). Freeze any unused yolks. Note that yolks should be cooked before consuming. Joong come in different shapes, depending on the region. 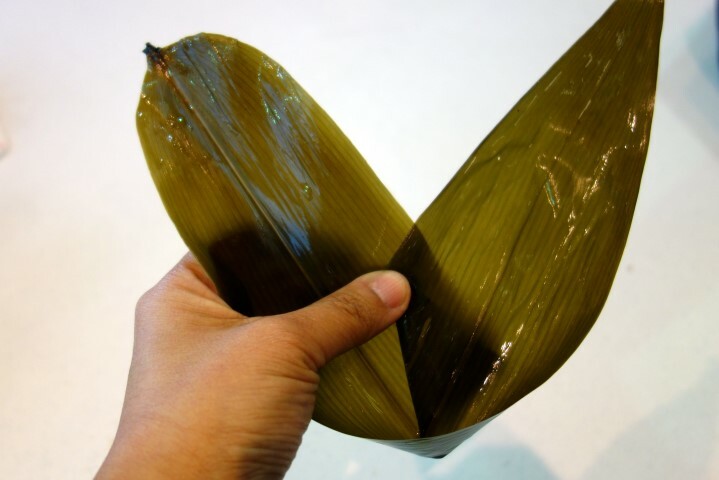 The traditional way to wrap them is by hand, using 2-3 bamboo leaves, depending on their size. 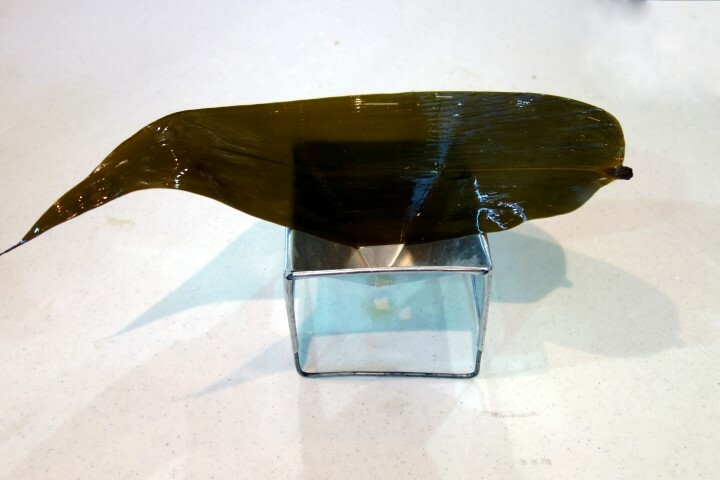 Here are step-by-step instructions on how to wrap joong using a mold. 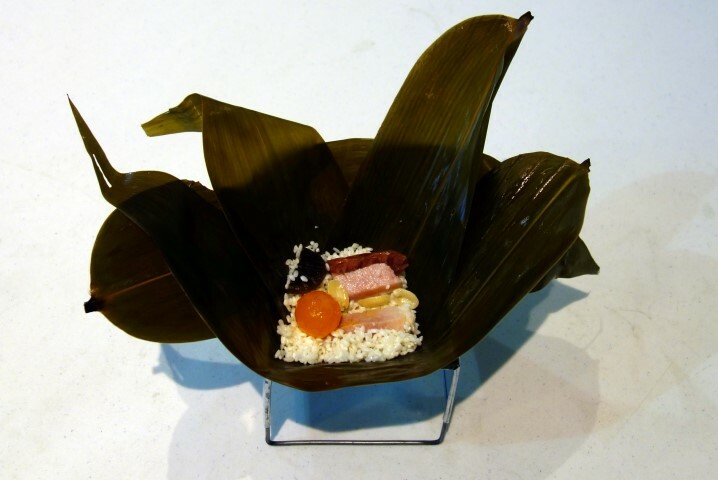 Lay one bamboo leaf, rib side against the mold (smooth side facing you). 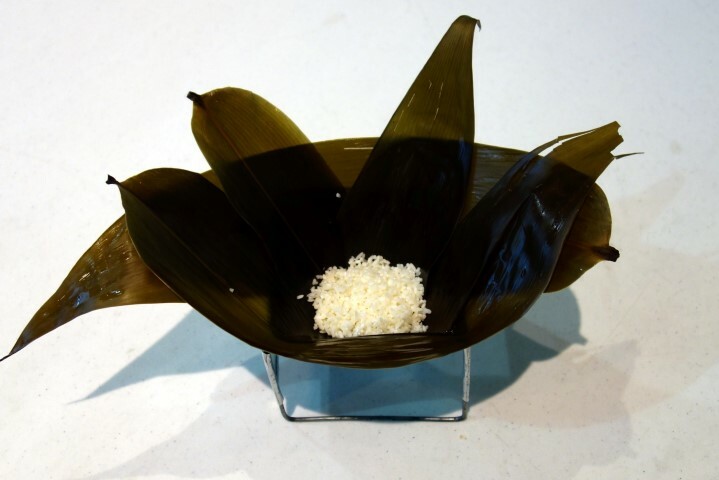 Ideally, line the rib of the leaf with the top edge of the mold. You will need the extra leaf at the top. Place the “bunny ears,” cone-side down into the mold to cover it completely making sure the leaves overlap to prevent any open seams or holes. Now you are ready to fill your mold! Add about 1/3 c. rice to the bottom of the mold. Add desired fillings: 2-3 pieces of meat, a spoon of peanuts, 2-3 pieces of mushroom, 1 or 1/2 salted egg yolk, enough to cover the surface. 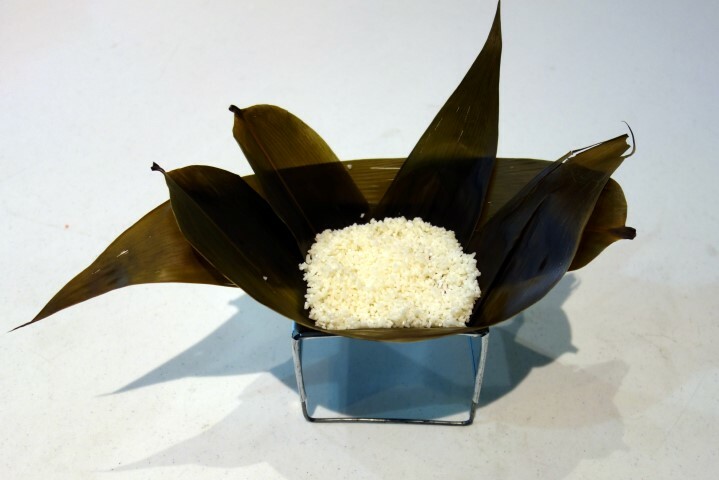 Add enough rice to fill the mold to the top. Pat the rice down flat so that it’s flush with the top of the mold. 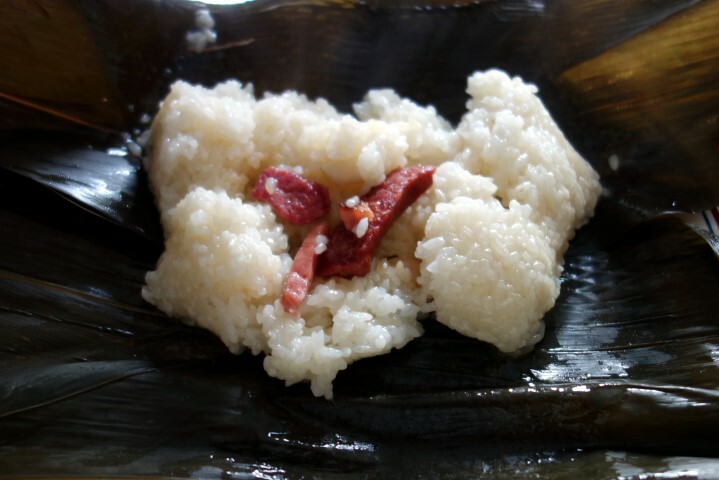 Add a 4th leaf (smooth side down, rib side up) to cover the rice. 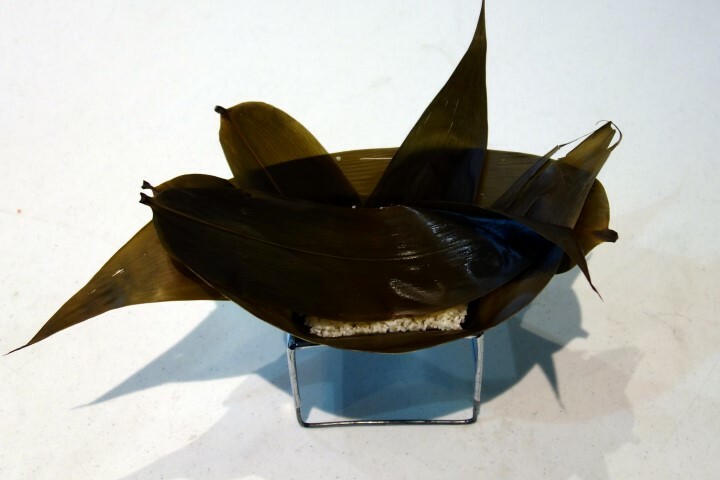 Fold the sides of the bamboo leaves towards the center, one side at a time, as if you were wrapping a present or burrito. Turn the mold upside down to release the joong. Use scissors to trim errant leaf edges as needed to keep the packet neat. Tie up the joong with kitchen twine to keep its shape. Cook the joong in boiling water for 2-4 hours. The cooking time will vary depending on how many you cook at a time. For a printable Word version, click here. 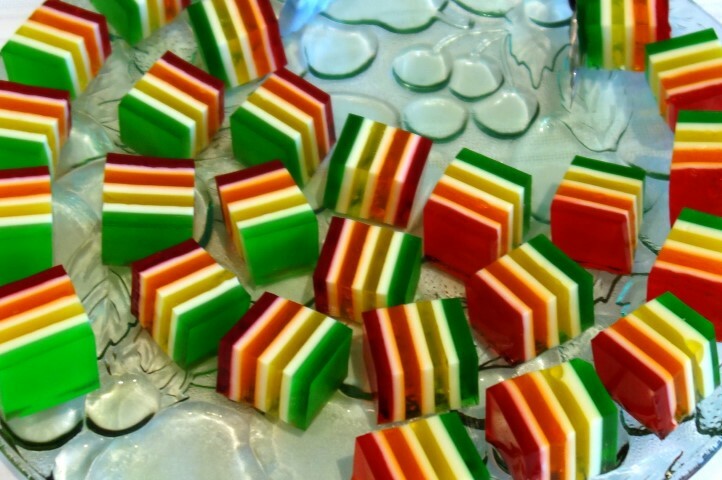 Jell-O Mixture: Dissolve each package of Jell-O with 1 envelope Knox Gelatin in 1 cup boiling water in a separate small bowl. (Stir well so that gelatin does not settle). 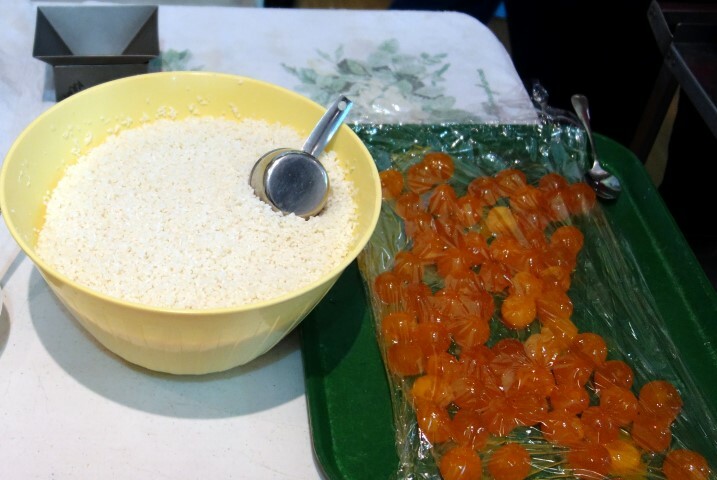 Milk Mixture: Dissolve 2 envelopes of Knox Gelatin in 1 Cup boiling water and mix in 1 can sweetened condensed milk. Divide mixture into 3 equal parts (a little less than ¾ cup each). Pour 1st layer of Jell-O into 9”x 9” Tupperware pan lightly greased with mayonnaise. (This is a little trick to keep Jell-O squares from sticking to pan.) Set pan on level shelf in freezer for 12-14 min. until Jell-O is firm. Then add 1st layer of milk mixture and set in freezer for 12 min. until firm. 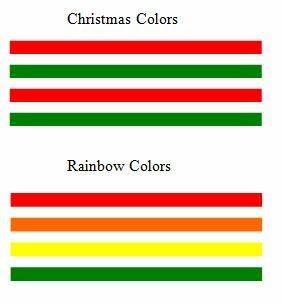 Repeat this layering process with the remaining Jell-O and milk mixture. 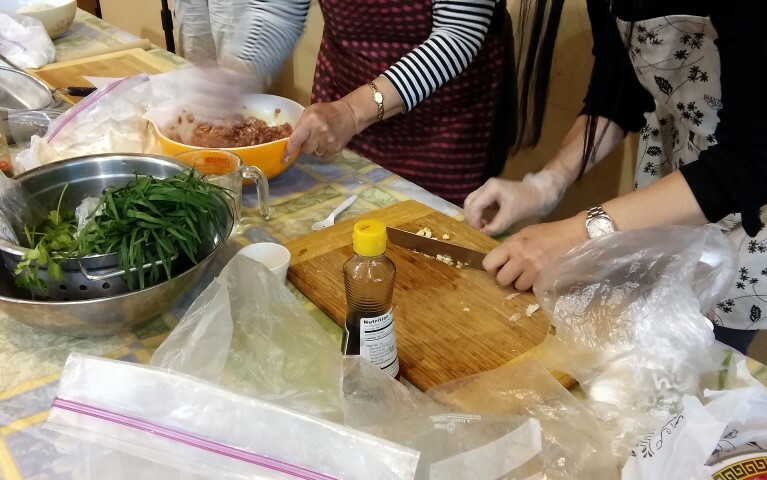 For our May 2016 program, Gui-Lan and her daughter-in-law came to show us how to make dumplings. In a big mixing bowl, slowly add 2 cups of cold water (room temperature) in the center and stir clockwise (or counterclockwise, choose one and keep that direction) and knead the dough until the bowl is clean. The water amount is approximate because it will vary depending on the weather and humidity. As you’re kneading the dough, add little bits of water as needed to incorporate any remaining dry flour. 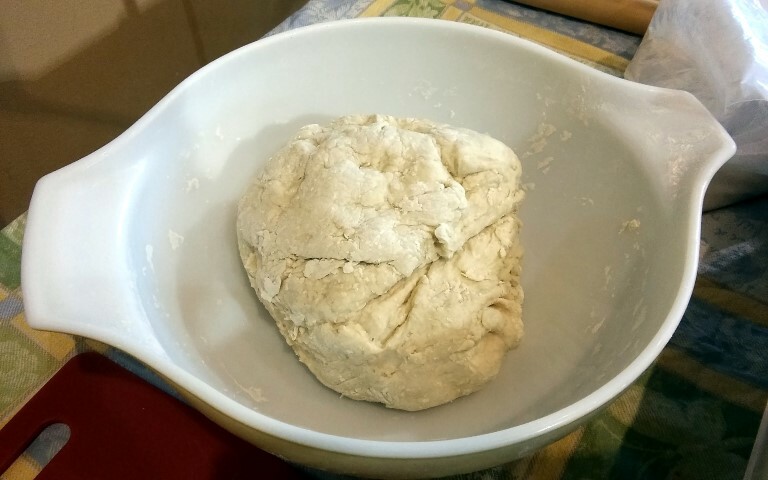 If it’s too dry or wet, the bowl will still have bits of dough. Knead until the bowl is clean–that’s when the dough is ready to rest. Cover the dough with a damp cloth and let it rest for 1-2 hours. See how the sides of the bowl are clean? The dough is ready to rest! While the dough is resting, prepare the filling. In a large bowl, combine all the ingredients and stir in the same circular direction until well mixed. Finely chop cabbage. Mix 1/2 tsp. salt into chopped cabbage, let rest until wilted, and squeeze the water out. Dip cabbage leaves in boiling water for 2-3 mins. Chop the cabbage and squeeze the water out. After resting for 1-2 hours, the dumpling dough looks like this. There are no dry spots and it’s dense and heavy like clay. 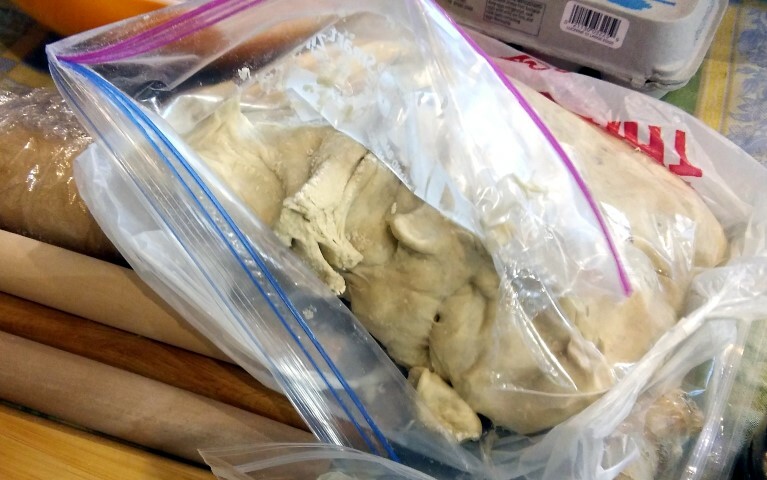 To test the dough for readiness, remove a small piece, and stretch it. If it breaks easily (like Play-doh), it’s not ready. When the texture is elastic and soft, it’s ready to use. Roll the dough into 1″ diameter log and cut in into 1″ pieces. Roll the pieces into small circles with a wooden rolling pin to prevent sticking. Rotate the circular piece of dough as you thin out the edges. The edges of the dough should be thinner than the middle. Place 1 heaping tsp. 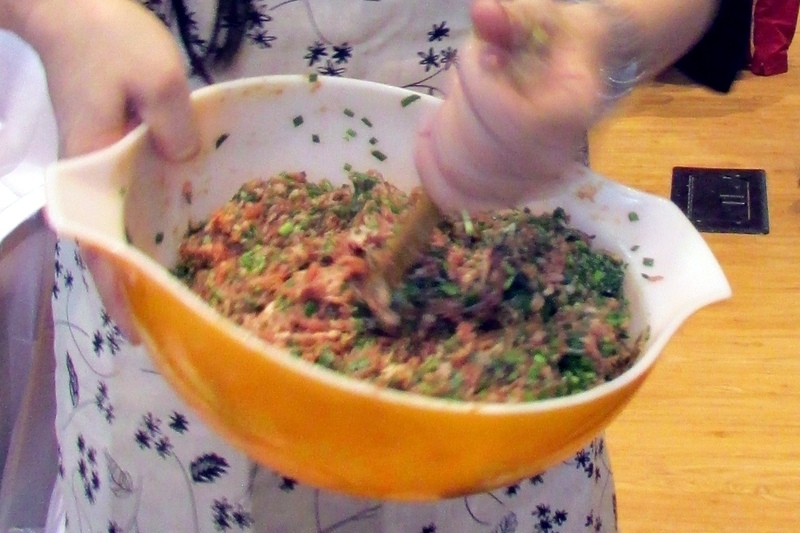 of pork filling onto each skin, fold and close the edge (crescent fold). 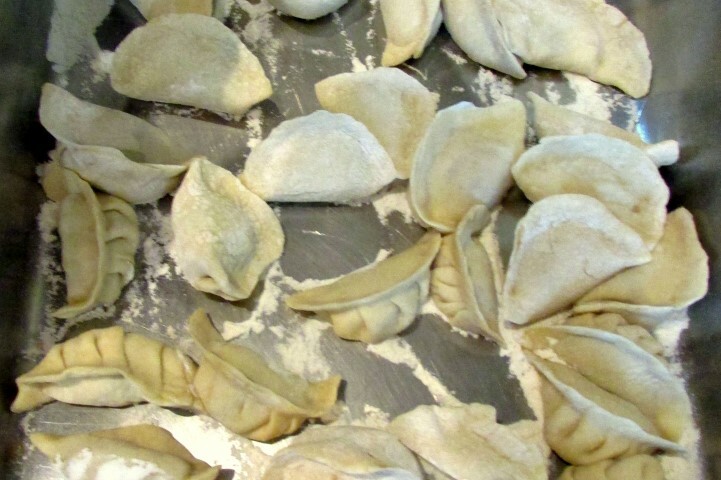 Set dumplings aside on a lightly floured surface until ready to cook. Set dumplings aside on a lightly floured surface until ready to cook. 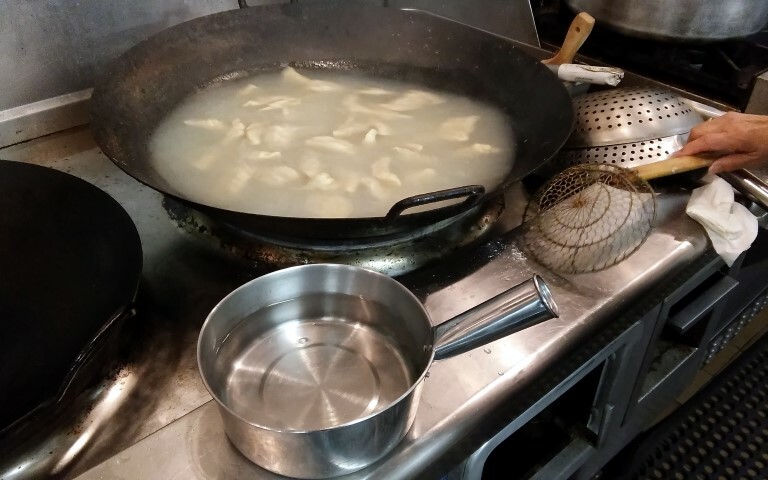 To cook the dumplings, boil a big pot of water. Drop 20-30 dumplings into the boiling water. 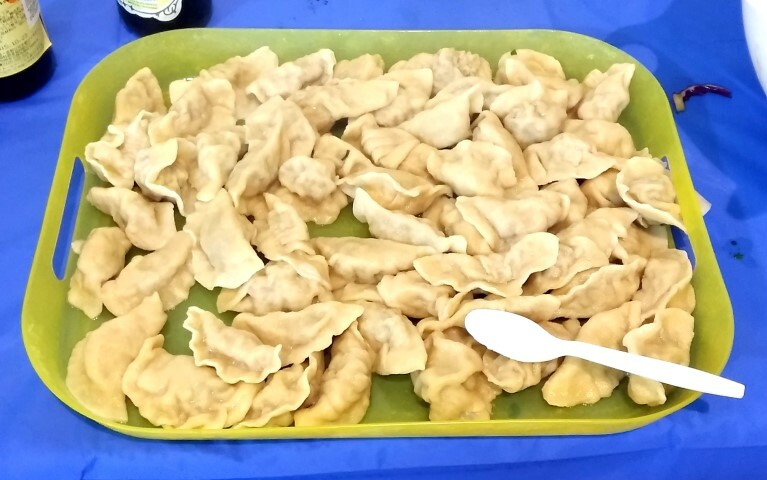 When the dumplings float to the top and the water boils again, add a cup of cold water to the pot and bring it to a second boil. Add another cup of cold water to the pot and bring it to a boil a 3rd time. 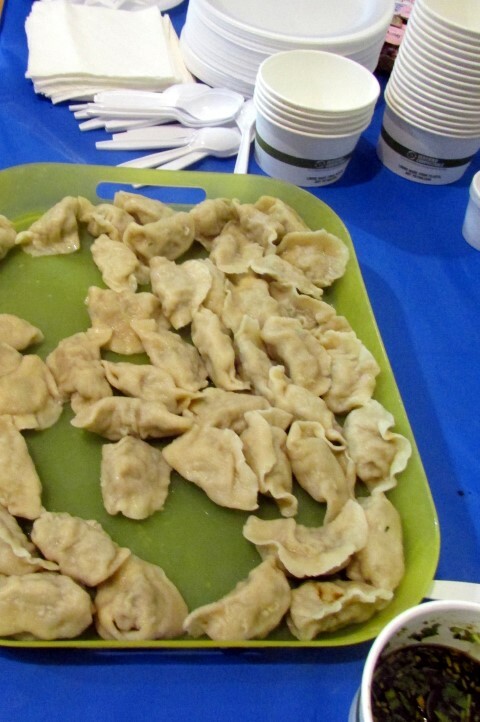 When it boils the 3rd time, use a slotted spoon or spider strainer to remove the dumplings from the water. The 3x boiling action ensures the filling is cooked thoroughly and creates the chewy skin. 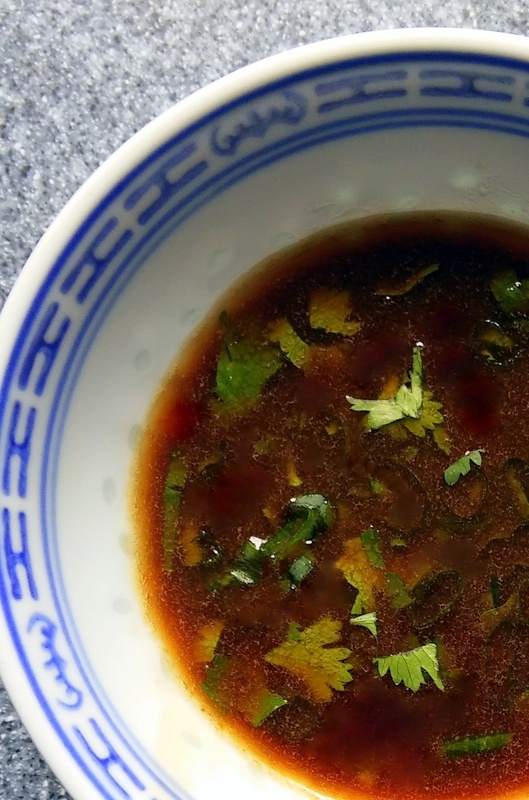 And last but not least, serve the dumplings with various accompaniments and condiments such as slivered ginger root, chili oil, chili sauce, and/or a dipping sauce. Mix all ingredients together and serve! Were you trying to figure out the flavors for the Savory Pretzels at the January 2014 meeting? The recipe below will let you know how accurate your taste buds were. 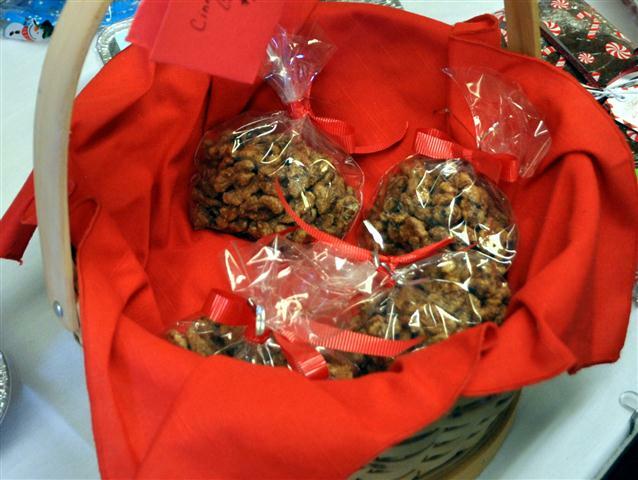 This recipe is shared by Emma Hom who first sampled these pretzels at a restaurant in Honolulu. She later found the recipe in a Hawaiian cookbook she brought back. Enjoy! Place pretzels in a re-sealable 2-gallon plastic bag. Add butter and seal bag; shake until evenly coated. 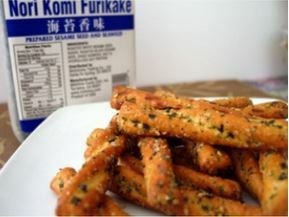 Mix together Ranch Dressing mix, garlic powder, and Furikake in a bowl. Add mixture to the bag; toss to coat pretzels evenly. Transfer to a cookie sheet to air-dry for about an hour. Store in airtight containers. In a small bowl, mix sugar, cinnamon, and salt together and set aside. In a big bowl, slightly beat one egg white and add pecans. Coat pecans with the egg white and add cinnamon mixture. Mix well. Spread the pecans loosely on a cookie sheet, try not to let them stick to each other. Bake at 325 degrees for 20 mins. When the pecans are done, immediately remove them with a spatula onto a cool flat surface so they won’t stick to each other. Clean mushrooms of dirt. Break off stems from mushroom caps (white mushrooms or baby bellas). Using a spoon, stuff mushrooms with Stonemill Kitchens Spinach & artichoke parmesan dip http://www.stonemillkitchens.com/product3.html. Place mushrooms about 1″ apart on a baking sheet. Bake in a pre-heated 400 degree oven until tops are browned. Serve immediately. Both the mushrooms and Stonemill Kitchens dip can be found at Costco in the refrigerated sections.